Dr. Salina Hayat Ivy, Mayor, Narayanganj City Corporation (NCC) graced the event as Chief Guest. Mr. Dabashis Bordhon, Deputy Director, FSCD, Mostak Hussain, Humanitarian Director, Save the Children along with key officials from NCC, FSCD, DDM were also present. Lauding Save the Children intervention, Dr. Ivy said, ‘I will request them to spread this initiative to other wards as well, specially which are already identified as risky. Even NCC is ready to finance, if required. ’ She also illustrated the necessity to train school students like UCVs. SCI Humanitarian Director Mostak Hussain thanked the Honorable Mayor for the allocation of 5 million BDT for disaster risk reduction in their annual Budget on behalf of Save the Children. 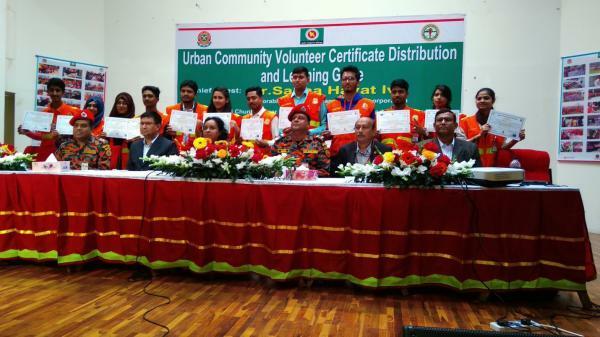 Certificate and ID card were also distributed among Urban Community Volunteer’s (UCVs) at the same event.